Wonderful Komodo Trek Tour packages packaged for those of you who want to experience Cruise using Phinisi sailing boats. This trip you will be staying overnight. 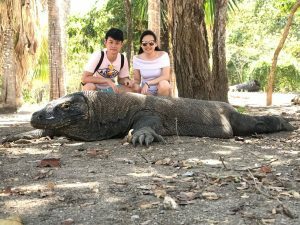 You can also see the ancient animals of KOMODO DRAGON in Rinca Island and Komodo Island and Snorkeling in Kelor Island, Manta Point and Pink Beach and trekking to see the beautiful panorama of Padar island in a two-day visit! You will be picked up by our Guides at the Airport, or at the Hotel and transfer directly to Labuan Bajo tourist jetty using an air-conditioned car to then start your escortion to Komodo National Park the first destination is Manta point for Snorkeling see Pari Fish, Turtle, Reef shark and Beautiful coral reefs. Along the way you will enjoy the beautiful panorama of the island – the island and the fishing village is amazed. After that the journey continues to Pink Beach for snorkeling, beach with soft pink sandstone and beautiful and many marine biota. Lunch on board and travel to Komodo Island. Arriving at Komodo Island you will be greeted by Ranger / Pawang Komodo who will guide you in exploring for trekking, observing the survival of KOMODO stars and other wildlife in their original environment such as: Wild buffalo, Wild horse, Monkey, Deer timor, Wild boar, And several species of endemic birds. After the trekking is complete you will be escorted to Padar Island. On Padar Island the guides will take you trekking to the top to see the panoramic landscapes and indentations of amazing three-colored beaches and breathtaking sunset views. Dinner and dinner on the boat at Padar bay. At 4.30 the guide will invite you to trekking again to the peak of Padar to witness the birth of the suria that day, the view of the landscape to the east and the land really fascinating it is great to capture that beautiful moment with your loved ones or friends with Sunrise at Puncak Island Padar. After that go back to the breakfast ship and continue the trip to Rinca Island, the second entrance for trekking and explore observing the survival of KOMODO stars and other wildlife in their original environment such as: Wild buffalo, Wild horse, Monkey, Deer timor, Wild boar, snake and Some species of birds are endemic. After the trekking finish back to the boat for lunch. Your journey will continue to Mejerite and Kelor Islands for Snorkeling, a place where you will dock to enjoy the pristine white sand beaches, a beautiful marine park filled with colorful fish and many coral reefs and from the top of Kelor island which is climbed about 15 minutes , Spectacular landscapes and ocean scenery. After that return to Labuan Bajo pier and transfer directly to Airport for flight back to Bali. Or direct us to the Hotel where you stay in Labuan Bajo.